Today we will round out our catalogue of Newark women on stage. Actress and singer Vivian Blaine was born in Newark on Nov. 21, 1921, to Lionel and Wilhelmina Stapleton. She attended Newark schools, and began her show business career at the now-defunct Mosque and Branford theaters. By the time she was 14, her stage-door father had her singing for a $1 a night at clubs, company parties, and police benefits. He also booked her with the Halsey Miller Orchestra. After graduating from South Side High School, she was appearing at the Governor Clinton Hotel in Manhattan. In 1943 she appeared in movies with Laurel and Hardy. In 1944 she had the leading role in the film 'Greenwich Village,' one she got after storming into the office of film producer Darryl F. Zanuck to demand a better part. Like the Houstons, Gloria Gaynor and Melba Moore hail from Newark or have Newark connections. They both continue to be active in show business and reflect well on their old hometown. Gaynor, 'Queen of the Discotheques, ' was born in Newark in 1947. One of six children, she went to high school here and was employed early on as an accountant. She later joined a musical group in Canada, but this lasted only a short time. Soon, she was soon back in New Jersey performing club dates with the Soul Satisfiers for a year-and-a-half. Later, she returned to New York where she put together her own band and was associated with Columbia Records. Gaynor was discovered in a New York nightclub by Jay Ellis. Her producers were Tony Bongiovia and Meco Monardo. Her first hit was 'Honey Bee' in 1973. In 1975, she signed with MGM to produce 'Never Can Say Goodbye.' But it was her stunning recording of 'I Will Survive' that took her to the top of the charts in Britain and America.' This emotional, almost defiant performance, later adopted as a gay movement anthem, rose above the increasingly mechanical settings her producers were fashioning for the disco market,' said one news account. Her other albums included: 'I've Got You,' 'Glorious,' 'Love Tracks,' 'I Have a Right,' 'Stories,' 'I Kinda Like Me,' 'I am Gloria Gaynor' and 'Power of Gloria Gaynor.' Her latest hit has been 'I Am What I Am' from 'La Cage Aux Folles.' She frequently tours the United States and Europe and considers Italy one of her favorite spots. Recently she began writing her own gospel material. A New York Times review of a performance in March 1979 said that she was solid, resourceful and in command, and that 'she moved from strength to strength, ending with a dramatically paced and beautifully sustained version of 'I Will Survive.' One suspects that she will. Actress and singer Melba Moore was born in New York City in 1945 into a musical family. Her mother Bonnie was a singer. Her stepfather, Clem Moorman, was a musician, too. Melba attended Newark schools including Arts High and went on to Montclair State College where she majored in music education, receiving a bachelor's degree. Before entering show business, she taught in Newark. She first joined the 'Voices' as a singer and pianist. One day she was interviewed for a job by Gerome Ragni, who was casting for members of the rock musical 'Hair.' As a result, she played a variety of roles including the female lead—the first time a black performer had replaced a white. It must have been very difficult for a college-educated, middle-class young woman to be the star of the nation's hottest hippie, no-holds-barred, American folk-rock cultural extravaganza. But the critics hailed her performance and she was quoted as saying, 'What 'Hair' taught me was to take a chance, to try.' Her next Broadway appearance was in 'Purlie,' a musical story of a black domestic on a Georgia plantation for which she won a Tony in 1971 as the innocent Lutibelle. During the remainder of the decade she toured and made many television appearances. In the 1970s and 80s she was active in films, making 'Lost in the Stars,' the film version of 'Hair,' and 'Flamingo Road.' Her television career included the 'Melba Moore-Clifton Davis Show,' 'Ellis Island' and 'Melba.' She's also making CDs. And she's set up the Melba Moore Foundation, devoting a portion of her earnings to children's charities. In establishing the Melba Moore Foundation she said, 'I want my life to be worth something.' Although she fell on hard financial times in the early 1990s, she rebounded, coming back as fresh and exciting as in earlier days. To her fans, she's always been a master of rhythm and blues, rock 'n' roll and pop. Now a born-again Christian entertainer, she's added gospel to her repertoire. One New York critic described her as able to belt out a good song and then '…be transformed into a sultry song goddess.' Recently she headed back to the touring road appearing in 'Les Mis' and the 'Cole Porter Show.' 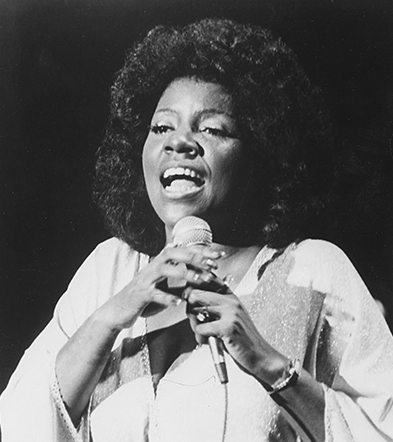 Looking back at her career, a 1973 review of her appearance at New York's Copacabana remains as fresh as if it were written today: 'Melba Moore's big mischievous eyes sparkle as brightly as her performance, and the urgent gospel that she pulls up from the well springs of her vocal resources is still an exhilarating and exciting sound. But when the beat is solid and Miss Moore swings into a clapping stand, she can generate a lively sense of joy, no matter what the orchestra is doing…' And, while the beat continues for Moore and her other contemporaries, it has left its own lasting impression in those long-gone Newark theaters, New York's theater heartland, and even across the sea. Newark's ladies on stage have left a lasting legacy.